A Delegation headed by Professor Zhenguo Yuan, the Dean of the Faculty of Education, East China Normal University, made an academic visit in Graduate School of Human-Environment Studies, Kyushu University, Japan, from March 17th to 19th, 2017, to further promote international exchanges and cooperation. An Academic Cooperation Agreement was signed with Professor Hiroyuki Yamaguchi, Dean of Graduate School of Human-Environment Studies, Kyushu University for the development of scientific, academic and educational cooperation relationship between the two sides based on the principle of equality and mutual benefits. The two sides planned to carry out cooperation in (1) exchanges among academic staff, administrative staff and students; (2) joint research program; (3) academic information and publications exchange; (4) other agreed academic cooperation areas, etc. In the meantime, the two sides also signed a student exchange agreement. 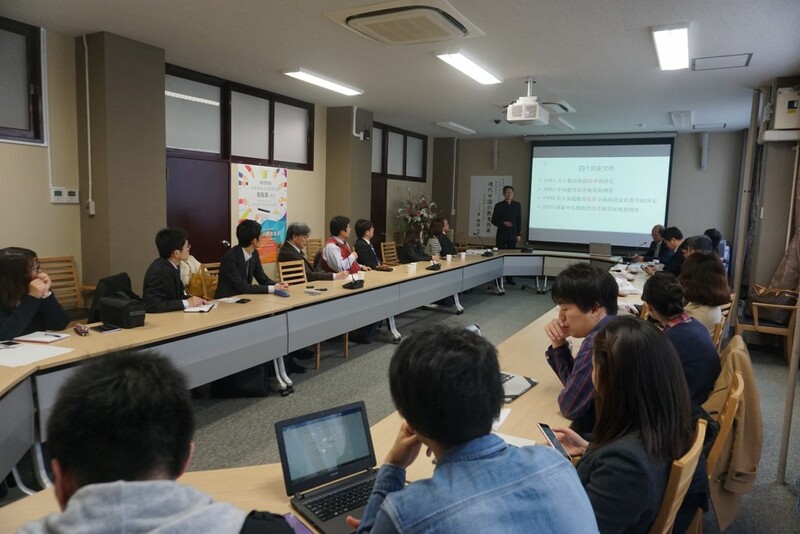 After the signing ceremony, a special memorial lecture for academic / student exchange agreements signed between two sides was held in Kyushu University. 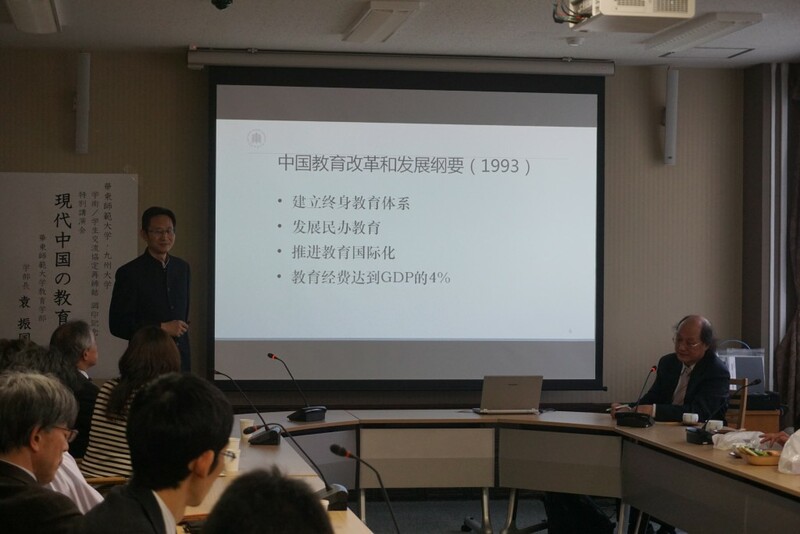 Professor Yuan gave an excellent report on “Educational Reform in Modern China” and received warm response. Professor Tingjin Zhi, Deputy Director of the National Institute of Educational Policy Research, Professor Guangcai Yan, Director of the Institute of Higher Education, Professor Zunmin Wu, Director of the Lifelong Education & Community Education Research Center, Professor Guoqing Xu, Deputy Director of the Institute of Vocational and Adult Education, Associate Professor Fuyi Yang, Director of the International Affairs Division attended the activities. 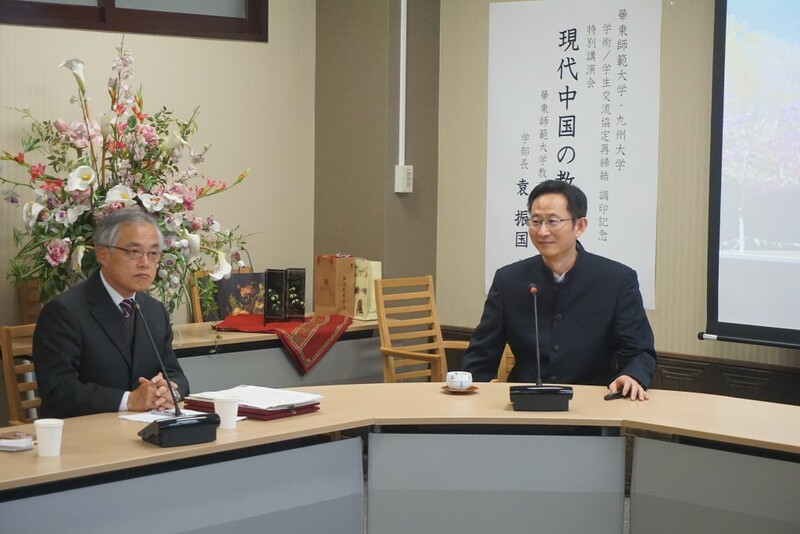 Cooperation between East China Normal University and Kyushu University in the field of education has a long history. Since an academic cooperation agreement was signed in October, 1988, the two sides have been committed to promoting academic exchanges and cooperation with each other. The Agreement signed this time will definitely further promote bilateral exchanges and interaction in various fields.